Astrophotographer Jeff Berkes took this image from Assateague Island National Seashore along the eastern shores of Maryland on November 5, 2016. 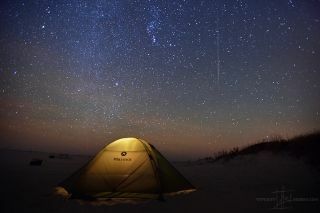 Taurid meteors dot the sky above as a skywatcher captures the gorgeous night sky in his tent below. Astrophotographer Jeff Berkes took this image from Assateague Island National Seashore along the eastern shores of Maryland on Nov. 5. To capture this shot, Berkes let his camera run overnight on a time-lapse sequence while he caught some sleep in the tent. He used a Nikon D4 and a Nikon 17-35mm lens and a 25 second exposure. The Taurid meteors, sometimes called "Halloween fireballs,"(fireballs are extremely bright meteors) create one of this year's longest meteor showers. During peak times, about a dozen or so meteors may be seen per hour by an observer with clear, dark skies. The Taurids come from Comet Encke, a short-term periodic comet that orbits the sun about once every 3.3 years. The Taurids are visible practically anywhere on Earth, except for the South Pole. They appear to originate in the constellation Taurus the bull. "All in all, we all had a very productive night out with the Taurids this year!" Berkes added.